To find the 'Map of Borobodur', click the link or the image. 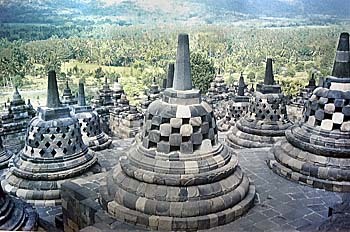 Some of the upper stupas of Borobodur. 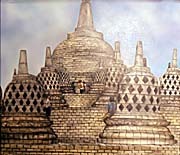 A contemporary painting of the uppest part of Borobodur by an artist who I don't know. Mass tourism harms the monument. Here: pupils under the main stupa. One of a great number of Buddhas of this kind. Most of them are damaged or completely gone. 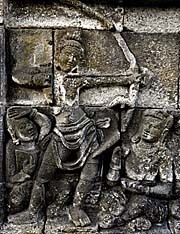 Demons are present everywhere at Borobodur. Some of them serve as a gargoyle for the drainage system. One of the 72 stupas on the circular platforms has been opened to give the visitors a view on how the Buddha statues inside look. Sketch of a statue of a bodhisattva, found in the Kedu plain. Image from Thomas Stamford Raffles, 'The History of Java', second edition of 1830. The first edition of the work was published in 1817. Five musicians. The first man plays a drum. A noble man is shooting an arrow. The man sitting in the left corner seems to hold a book in his hands. This might be Buddha in one of his former lifes. A face of the past. Fragment in one of the galleries. Another head fragment. All these faces and sculptures must have looked very lively in their original state, with a ground coat and a pastel painting. 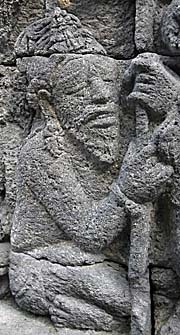 A face relief in Borobodur. Still, after 1,200 years, one can see how refined the single traits were carved into the volcanic stone. 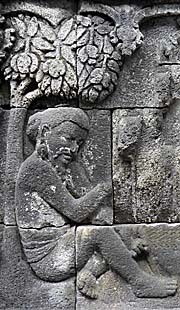 An old man on one of the reliefs of Borobodur. Prince Sudhana is visiting one of his friends. The friend, who seems to be a bodhisattva, is seen on the next picture below. Interestingly, they both look into different directions and do apparently not communicate with each other. A deity, bodhisatva or a king, turning his back to Sudhana, focussing on other people. 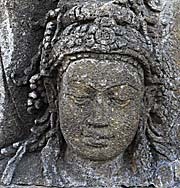 A female protagonist in one of the reliefs. A man, sitting under a tree in conservation with the two people in the picture below. Both images are actually a single shot. A woman with a jar. It's always surprising how detailed, precicely and lively the reliefs still appear after 1,200 years, even although they are bereaved of their coat and paint. A salesperson selling something in a pot to the people on the picture below. At his foot seems to be a stove. Both pictures are part of the same relief which includes more people who are apparently celebrating together. Seems to be a female bodhisathva. In her right hand she holds a lotos stem with flower. A princess, a noble woman, a deity or a dancer? Interpretations of the reliefs are all but easy. 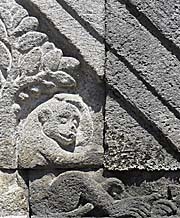 A decorative panel in Borobodur. Candi Pawon, the smallest of the three temples of the Borobodur group. 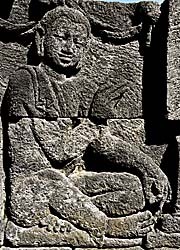 A praying man at Candi Mendut. 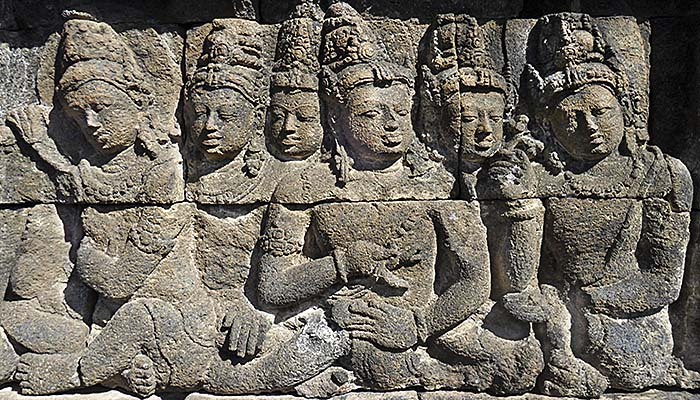 The reliefs of Candi Mendut are in a remarkably good shape of conservation. A monkey, looks like a common macaque, is sitting under a tree. 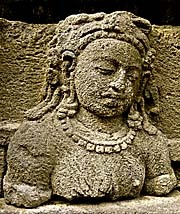 A relief at Candi Mendut. 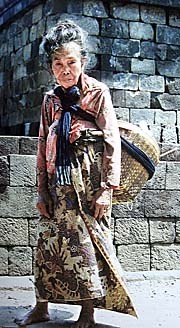 Saleswomen at Borobodur. The entrance area is crowded with stalls, vendors, batik- and souvenir shops and restaurants. Another saleswoman, selling souvenirs to tourists. The image top right shows prince Sudhana at one of his visits to 110 friends on the search for the final wisdom. 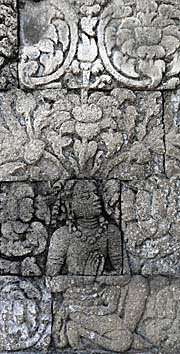 The image bottom left shows one of the upper 72 stupas of Borobodur. Aside from world famous Angkor Wat in Cambodia and Pagan in Burma/Myanmar, Borobodur (also: Borobudur) is one of the three 'main sights' in Southeast Asia. Borobodur is a huge, medieval buddhist monument built as a stepped pyramid over nine levels; access to the top stupa is given by four stairways. Borobodur is the largest buddhist temple in the world. Borobodur monument, seen from nearby Dagi Hill, still within the Archeological Park. 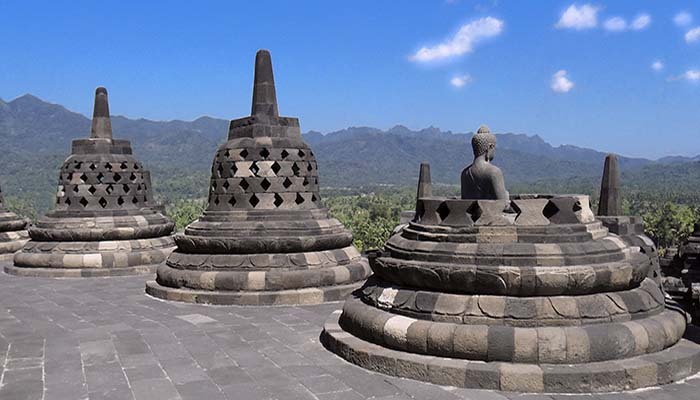 Borobodur is built on the Kedu plain in south central Java. 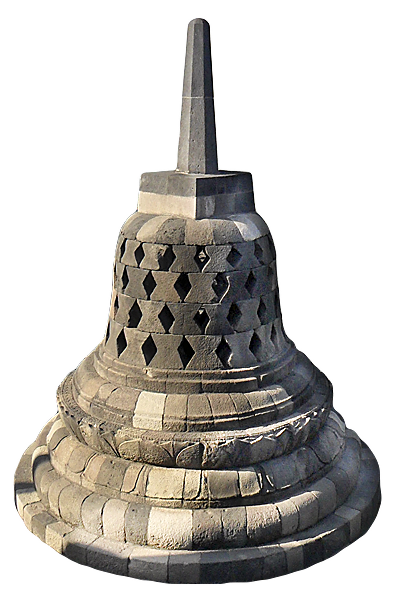 The erection time of Borobodur spans some 70 years between about 760 CE to 830 CE. There was plenty of stone ned (55,000m3) and it hasn't to be transported over a very long distance. Two million stone blocks were first roughly processed at the riverbanks of the nearby Progo River and then transported by ox carts, horses and elephants up the monument hill and processed there with metal tools. The constructors didn't use mortar - the stone blocks are shaped perfectly to fit together. Additionally a drainage system was integrated, to avoid the underground get soaked with water and weakening the whole, heavy building. The temple was designed as a center for pilgrims and it's art belongs to the finest in the world. Borobodur is as a whole as well as in all it's details a masterpiece of architecture and arts. There are thousands of statues and reliefs on the temple building, telling many detailled stories about buddhism as well as giving insights into the medieval life of 8th century Javanese people. 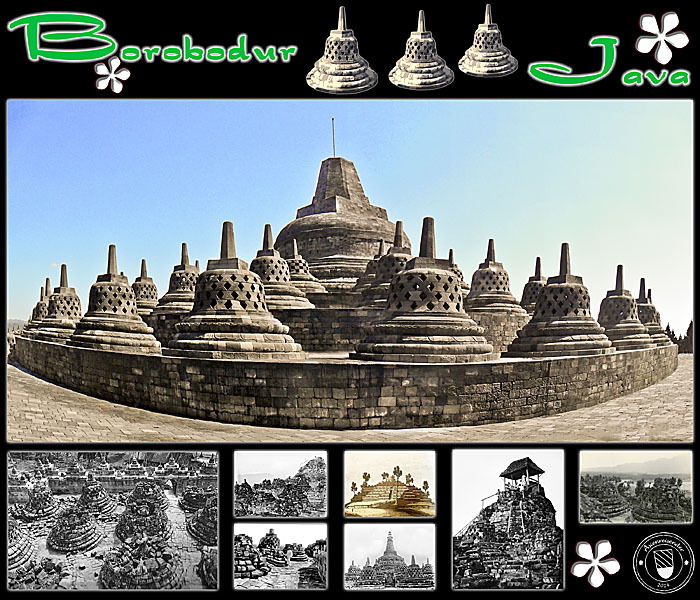 Borobodur gives more information about Javanese history than Javanese history gives information about Borobodur. That is so because all the medieval Javanese literature was written on organic materials like, most prominent, palm leaves. They couldn't stand the test of time - it's the same story with the empire of Angkor and it's famous state temple Angkor Wat and the empire's capital Angkor Thom. The tropical monsoon climate ate the scrolls forever. When Southeast Asian cultures declined and stopped the permanent copying of established writings, they were lost for the afterworld. The frescos of Borobodur therefore remained burried under soil and volcanic ashes for almost a millenium until the monument was discovered by Europeans in 1814. For sure the society which built Borobodur had a great deal of free resources to do so: labour, food surplus from the very fertile Kedu plain with it's volcanic soil, and profound intellectual capacities and technical knowledge. This society transformed much of it's resources for erecting a monumental building which introduces a gentle, non-violent and non-martial way of life. That hints to the historical 'Borobodur society' as maybe one of the most human or biophile civilizations in world's history. Borobodur is a unique building. There is nothing else on earth comparable to it's architecture and the great frescos. There was no model for the creativity of the architects and the artists. It was a great creative challenge to visualize the old Sanskrit texts of Indian/buddhist origin into lively painted images, particularly for many of the texts and teachings are quite abstract. The Borobodur monument is a stepped pyramid, build on a natural but widely extended hill, leading up four levels who are presenting over six kilometers galleries of reliefs with stories about buddhist teachings. On top of the gallery levels, which are square shaped, are three more round shaped levels with 72 perforated stupas in which each a meditating Buddha statue is sitting. The very top of the building forms another large stupa, the only part of the building with an inner space. The big, uppermost stupa is completely free of any ornaments. Might be that it is meaned as a symbol for a clear state of mind. Nowadays the inner space of the main stupa is sealed. So, Borobodur is full of buddhist symbols and is shaped as a mandala (a reconstruction of the universe in the buddhist view). The monument is made of incredible precision and done with an immense effort of human labour. On the upper terraces are 72 Buddha statues placed into perforated, semi-transparent stupas. They all are of an unique style. There were no ancient palace buildings or remains of cities found in central Java. That makes historians conclude that the people here in the time at around 800 CE lived in villages only. It's anyway a similar pattern over all the ancient sites of Southeast Asia, that only sacral buildings were built in stone and remained over centuries, while the secular buildings, including the palaces of the nobles and kings, were built of organic materials like wood and bamboo. They never lasted long after they were once abandoned. However, west of the main monument there were traces of a former monastery found. Although there are no inner rooms inside the temple, there is an inner space inside the central top stupa. In it was an unfinished Buddha found. The fact that it was unfinished gave plenty of reason for speculation. Some archeologists meant that it was a symbol for Buddha's spiritual perfection, which could not find any expression in arts. Well, that sounds weird to place an unfinished, disproportioned, obviously imperfect piece of art as a symbol for perfection and enlightenment, particularly since any other detail in the monument was made of the highest quality. Others claim, that the original was stolen and the unfinished Buddha sculpture was a replacement done in 1844. There are accusations that that was done by a Dutch colonial officer who was in a powerful position in Kedu at that time. That sounds much more probable. Anyway, nowadays the top stupa is closed and the inner space is covered in stone. The unfinished Buddha is now in the nearby museum. Besides, below the other stupas on the three circular levels are funerary chambers, containing the ashes of ancient deceased. By the way, there is a competitor of Borobodur merely some 60 kilometers away from it: Prambanan, a huge hindu temple city, only a bit less impressive than magnificent Borobodur. 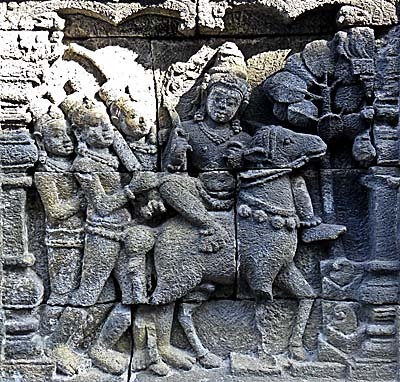 For further reading on the complicated relationship of the Sailendra and the Sanjaya dynasties in medieval Java have a look for the chapter on the Mataram empire on the Prambanan page. 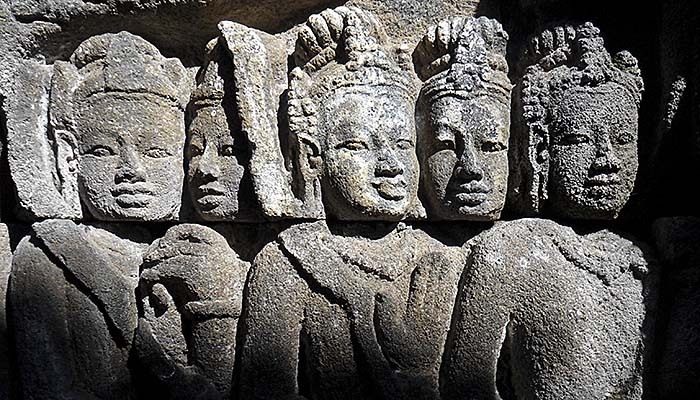 The time when Borobodur was built comes together with the Sailendra (Cailendra) dynasty on Java. It's supposed that the Sailendra were descendants of the royal elities of the empire of Funan (Funan was the first Southeast Asian empire and a predecessor of the medieval Khmer empire of Angkor. Funan was coined by the first Indians who settled down in Southeast Asia; they brought hinduism and (Mahayana) buddhism with them. Knowledge about the Sailendras is gappy. Their activities streched out to Sumatra and along the coasts of nowadays Cambodia and Vietnam. 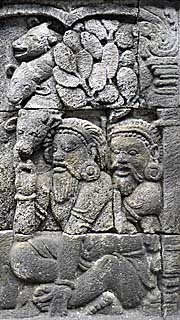 The Sailendra's king Indra attacked in 774 CE and 787 CE the Champa empire in the area what is nowadays south Vietnam. The Indian archeologist H.B. Sarkar points out that the Sailendras might have been ruled over the empire of Srivijaya in Sumatra as well. There are alternative theories that the Sailendras directly came from south India to Sumatra and Java. 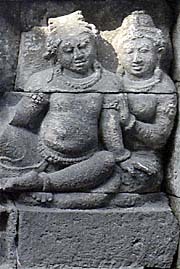 The Sailendras were rivals of the Sanjaya dynasty and forced them out of central Java in 746 CE. Sanjaya was a pirate king. 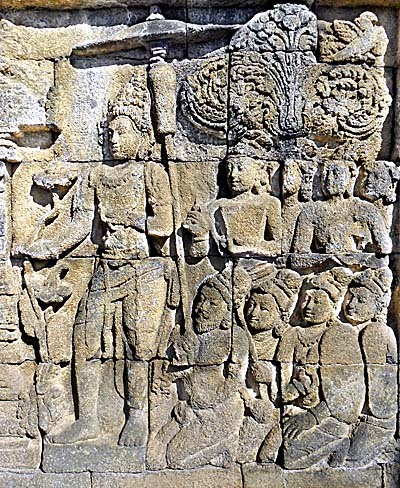 The defeated Sanjaya came back at around 824 CE under king Patapan. 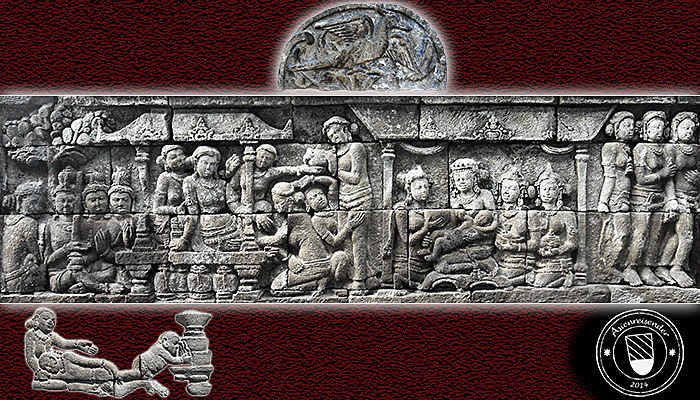 In a source from 832 CE Patapan is the only named ruler of Java. 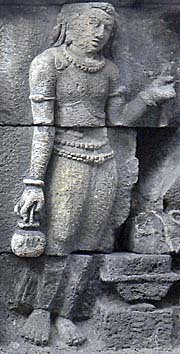 The last princess of the Sailendras (Pramoda Vardhani) married Pikatan (either another name for Patapan or his son). A king, carried on a bier. On the right side are armed men, probably soldiers and an elephant, symbol of power and strength. On the left side in the background there is a jewellery tree to see. 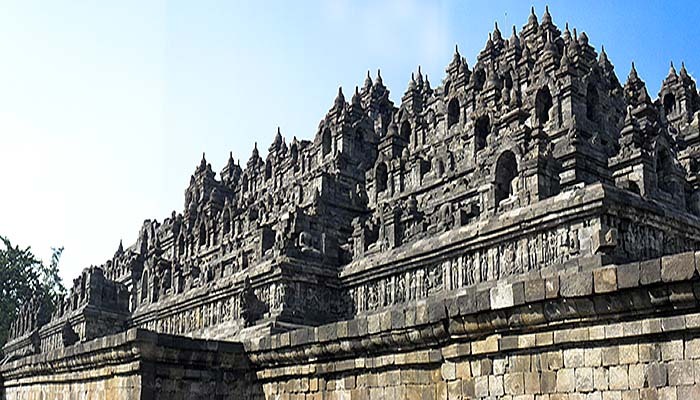 The architectonical heritage of the Sailendras is the monument of Borobodur. It was their manifestation of power. 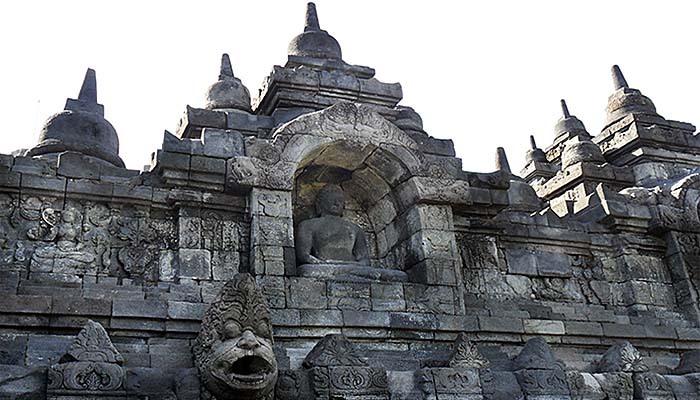 Besides the three temples of Borobodur, Pawon and Mendut the Sailendras let built a great number of buddhist monuments in the central regions of Java. However, Borobodur and the two smaller temples nearby are not designed to glorify the Sailendras personally. 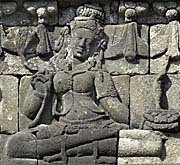 Borobodur's counterpart was Prambanan, erected by the competing Sanjaya dynasty. The Sanjaya followed the hindu Shiva cult, while the Sailendras stood for Mahayana buddhism. According to a number of marriages between hindu and buddhist nobles there seemed to be no serious conflict between the two religions. Religious struggle came to Indonesia first with the spread of islam. A small part of the Borobodur monument seen from the foot. Below is one of the galleries to see, in the right part four gates who let the visitor pass the stairways on their way up to the top. Several Buddha images are in artificial stone arcs placed; top left there is the main stupa on the very top of the pyramid. Art is almost always the art of the ruling class. It's their message they tell to the people. In this sense the ruling class tries to emphazise that their rule is a good and superior rule, traditionally legitimized by higher powers, and it's suggested to be for the benefit of the whole people/nation. They intend to create consensus. What's usually not told is the violence and the permanent struggle by which they came to power and maintain it. It's never representing the view of the common people, how they suffer under the rule and what's their problems. The construction of the big monument required hard physical work for over seven decades. In the sources I studied I didn't find a hint on slave labour at Borobodur. Authors claim that the rule of the Sailendra based rather on 'ritual power' as it has been in old India as well. That sounds for a 'flat hierachy'. Though, one should be careful hearing this. 'All political power results out of a gun barrel', as Mao Tse Tung stated. Slavery was common in former centuries (as it is still now, in fact). It's very probable that the hard and dangerous work of transporting the heavy stone blocks was done by slaves. While in the reliefs of Angkor Wat the slaves of Angkor are depicted, here we don't find any hint to slavery. Candi Mendut, 3 kilometers away from Borobodur. 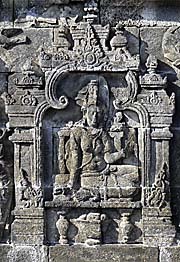 Mendut shows a number of reliefs as well as Borobodur, of whom the most are in quite a good condition. Among them is Buddhas first sermon in the deer park near Benares, after his enlightenment. There are two other, much smaller temples nearby. 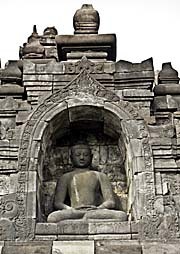 It's Candi Pawon, 1,5 kilometer away from Borobodur main temple and Candi Mendut, 3 kilometers away from the main temple. All three monuments were built in the same time and are positioned accurately in a line. I suppose, that there was a straight procession road in the old days, connecting them. Now it's not. At Waisak day, which celebrates the birth, enlightenment and death of Buddha on a full moon day in either April or May every year, several thousand buddhists come to visit Borobodur. They form a procession then along the temple corridor heading to the main temple. 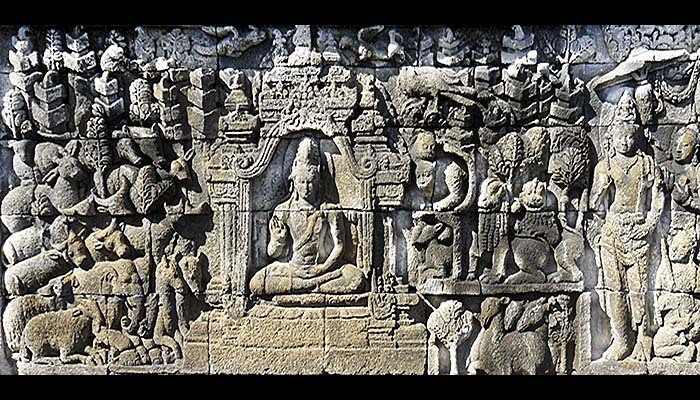 Consequently the narrative galleries of Borobodur start at the east entrance. The frescos are all aligned in a clockwise direction. 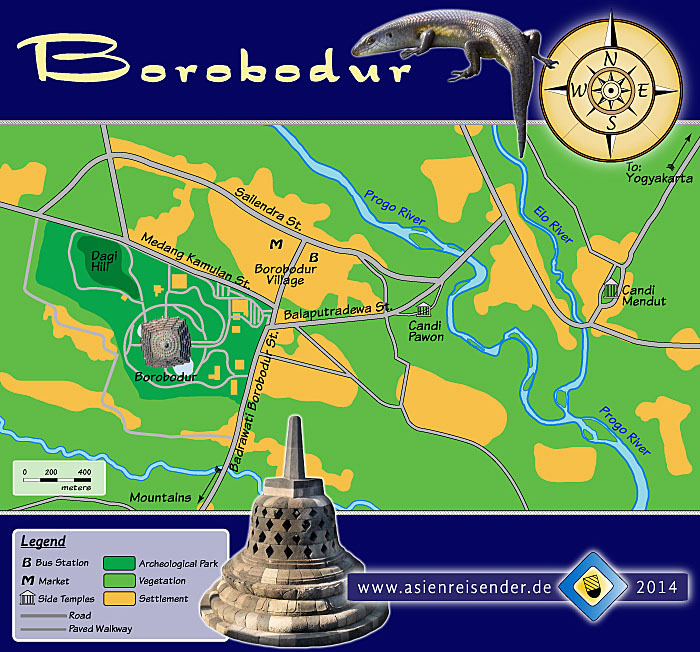 A map of Borobodur / Borobudur and it's surroundings. 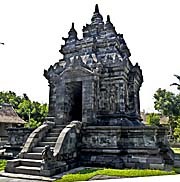 If you draw an imaginative line between the main temple and Candi Mendut, the line is crossing Candi Pawon. 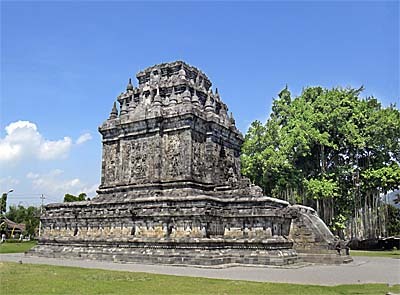 Pawon temple is about 1.5km away from Candi Borobodur, Candi Mendut another 1,5km. In medieval times, when Borobodur was still used by the culture who built it, there was a procession road in a straight line between the three temples. Pilgrims arrived at Candi Mendut and got their first spiritual introductions there, before they continued their way via Candi Pawon to the main temple. The function of Candi Pawon is still not clear, since there was nothing significant found in this smallest of the three temples what would hint to it's purpose. 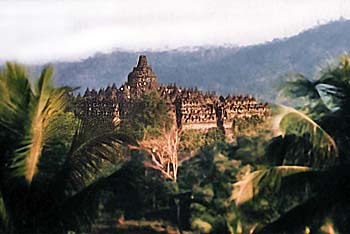 Although Candi Mendut is considerably larger than Pawon, the main temple of Borobodur is by far the largest of the three. 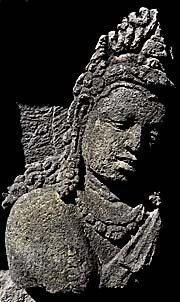 After 928 CE the central Javanese cultures disappeared and central Java was mostly depopulated. It's still not clear due to what reasons. Might be the nearby volcano Merapi broke out and made a survival for the local civilizations impossible. 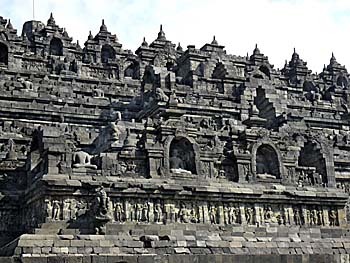 The depopulation also hit the hindu cultures on the Dieng Plateau and Prambanan. Borobodur wasn't completely forgotten, but it wasn't an important centre for activities or pilgrims anymore. There was a major outbreak of Mount Merapi in 1006 CE. Merapi's ashes were blown on the monument by the winds and it became over big parts covered with volcanic fallout. Trees, bushes, flowers, grass - in short words: tropical vegetation, jungle grew over Borobodur. 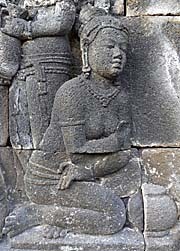 In 1548 CE there was a great earthquake in Java which probably affected Borobodur temple and caused the breakdown of the upper stupa. In this long phase of Borobodur's history it was unavoidably raided by countless treasure hunters. There were valuable pieces of jewellery and other objects taken from the site. In 1814 the site was (re-)discovered by a British officer. The discovery was notified to the then general-governor of Java, Thomas Stamford Raffles (governor of Java in the years 1811-1816). Raffles immediately decided to perform a cleaning and a first, basic restoration of the monument. However, in Raffles famous work 'The History of Java' (1817), Borobodur is mentioned only briefly. In 1835 further cleaning works took place and much of the temple came back to daylight. In the years short before the first world war restaurations were made under the supervision of the Dutch army officer Theodor van Erp. 1911 the temple was in a better state than before, some threatening breakdowns of walls in the galleries were prevented; but in long term the restoration activities might have harmed the building even more. Conservation techniques weren't that evolved in the first half of the twentieth century. Treasure hunting continued over these times; this time it were Westerners who were obsessed by all the stories about treasures found in ancient Egypt sites. Without restoration efforts over decades in the 20th century, the grand monument would have been mostly gone now. So the upper stupas look really good nowadays, and for most of the visiting crowd they are the most representative part of Borobodur. The black-and-white pictures show the state of the building before the first restoration phase under the supervision of Theodor van Erp began (1907-11). The man with the white suit in the second picture below left is van Erp. Earthquakes damaged the structure of the building, while the aggressive volcanic ashes destroyed the surfaces with the paintings and harmed the reliefs. The original paintings are completely gone. The picture below left shows how much the upper stupas were damaged, and many of the walls of the galleries further down were on the brink of collapse. Also the upper part of the main stupa was already collapsed. The photo in the middle below gives us a glimps on how the main stupa looked in former times. It was round-shaped, while the square-shaped form nowadays reminds rather to the common concrete architecture of the 20th century. The arrester is of course a modern addition to the building. It's possible that the top of the monument was damaged in the past by strokes of lightning. The very small coloured painting in the middle below is from the early 19th century, when Borobodur was rediscovered (in 1814). Main image and photocomposition by Asienreisender, 2012/2014. The sources of the historical photos are different websites. They are all common-free, for they are older than 70 years. The Tropenmuseum in Leiden/Netherlands has a large collection of images. 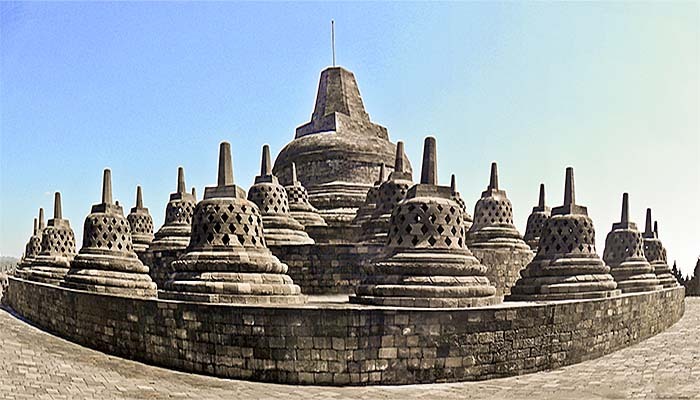 A thorough restoration programme in the years 1973-84 under the aid of the UNESCO (United Nations Educational and Scientific Commission) made Borobodur fit for the future. It's a UNESCO World Heritage site now since 1991. Prince Sudhana is on the search for the final wisdom. For that he is consulting many bodhisattvas, deities, noblemen and people of wisdom and spiritual experience. On one of his 110 voyages to good friends Sudhana is attacked by cannibals, as it is shown on this panel. The reliefs and the statues were built in three steps. First the sculptors (skilled masters) made the outlines. Then their apprentices did the rough work. In the third step the masters accomplished the final, filigree work. After that the sculptures and reliefs got covered with a white plaster and were painted in pastel colours. That made the original state of the reliefs much more lively than they are now. Borobodur was much more impressive in it's original state as it is today. What we see now is merely a skeleton of the original. A great portion of the Javanese population of the time must have been very gifted artisans to be able to build such a perfect construction with all the sophisticated details. These medieval Javanese were apparently much more cultivated and skilled than the contemporary society with it's dirty surroundings, bad manners, lies, din, plastic litter and favour for low-quality consumer goods of all kind without any understanding of it. Borobodur as a whole looks very impressive, but when it comes to the details, it's rather in a poor state. Most of the reliefs are damaged or barely recognizable. As mentioned above, the latest outbreak of the Merapi volcano in 2010 poured it's ashes again over Borobodur and the acid substances in it affected the reliefs. Besides the state of restauration is not the best. In the mid 1990s there were stonemasons to see working around the monument. Now, in May 2012, I don't see any ongoing work of restoration. Such a building is, in fact, an eternal building site. There is always what to do on it. But, there is no money for it. A party scene. People are sitting together, having food and drinks. 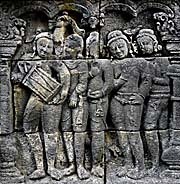 Three men in the middle left of the relief do misbehave. The reliefs are crucial for an understanding of the meaning of the monument. They tell many different stories. Among these stories are those of people who are, in buddhist terms, yet on a very low state of personal development, stories about Buddha's former lives (it's supposed that Buddha had 500 reincarnations before he went eventually to nirvana; some of his lives he lived as an animal, in others he was even a bandit or robber), stories about Buddha's last life as a Buddha and bodhisatva (someone who is enlightened already and could reach nirvana, but prefares still to live on earth for some more time to teach others the way out of suffering). The most space in the reliefs and also in the highest places on the three upper galleries got the story of prince Sudhana of north Pancala and his search for wisdom. Sudhana, a royal prince on the search for wisdom and truth together with his followers. 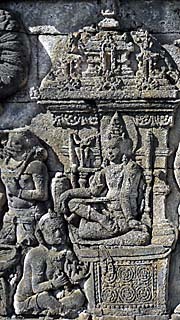 In his right hand he holds a lotos stem; one of his followers, kneeling behind Sudhana, is sheltering him with an umbrella. This story is called 'gandavyuha' (sanskrit = 'The construction of the world as an air bubble'). The story is quite abstract and depicts visits at different teachers as well as mysticle visions. Sudhana undertakes a long voyage to visit 110 good friends. These friends are from all social classes, men, women, children; many of them are also supernatural beings. Once Sudhana even meets Shiva, the popular Hindu [!] god. The message seems to be, that enlightenment is not to get out of one source only, and everybody is capable of receiving it. The story at the temple's bottom begins very concrete and becomes upwards more and more abstract. The lowest reliefs are under the earth. That's a pity because they describe very much the life of the common people, not being advanced on a spiritual voyage. I would expect more insights of the all-day-life of the Javanese society of the time on them. The fact that they are under the ground now is most probably due to severe problems in an earlier building phase. The monument became to heavy for the underlying ground and began to slide away. So it was necessary to build a new, five meter big wall around the foot of the monument to support the whole construction. The victims of this necessary static operation were the lowest reliefs. There are many details and decorations as certain humans, buildings, plants and animals on the reliefs, who have nothing to do with the actual story which is told. There is even the shop of a gold dealer to see on one of the reliefs. They are decorative and are an expression of the artists to make the stories more lively. Some (or many?) of the human figures might be drawn after the example of concrete people of the time as nobles, princes, kings, some of the artists themselves etc. Remarkable is, that on none of the reliefs there is any violence, no war, no fighting displayed. Sidharta Gautama's (Buddha's) mother Maya on the way to Lumbini Park. After she knew she were pregnant, Maya decided to contemplate and clear her mind up in a quiet surrounding. Many descriptions are events of all-day-life. It's about people, buildings, ships, methods of husbandry, clothing, jewellery, dances, houses, carts, instruments etc. 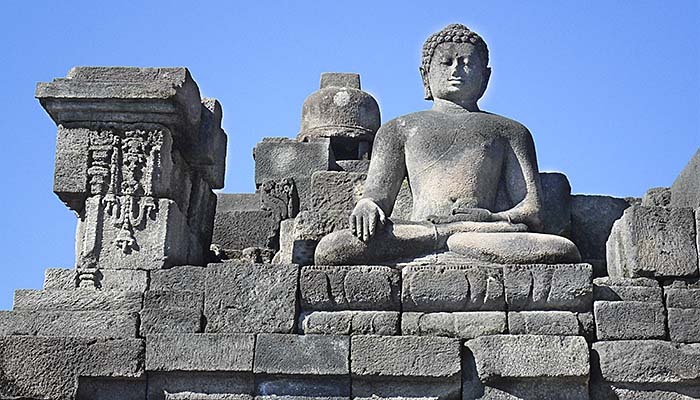 That gives not only an insight in the life of 8th and 9th century people on Java, but is also a hint for that to Borobodur came people from all social classes and for different reasons. Anybody could find here somewhat what related to him or her. While on the lower terraces with the relief galleries most pilgrims probably didn't stop for very long at a certain spot, the upper terraces with the Buddha statues gave space and opportunity for meditation. Assumedly teachers, probably monks, led pious believers along the galleries and explained the principles of the religion and exemplified buddhist lessons by the painted reliefs. The whole way up might have lasted more than a single day. The visitors exercised several rituals on certain points before continuing. The whole way up was as well a physical as a spiritual ascent to the highest source of mental power. By the way, many of the reliefs are still not identified in their meanings. Compared with the ancient buddhist writings there are some divergences. That was certainly done on purpose, because visualizing the buddhist ideas is a very difficult thing to do. Some more impressions of the very worthwhile to enjoy reliefs and statues in form of an approach from the ground to the top of the monument in a slideshow containing nine photos. The slidewhow won't work on all viewports, respectively browsers; particularly older versions of Microsoft Internet Explorer (MS IE 10 beta version and all below) will show quite a mess of it. Other older browsers might rather show a blank space. If you hover with your mouse over the show, you'll get detailed information about the order. 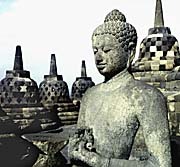 Borobodur is a first class monument of worldwide attraction. It has become a national symbol also for Indonesia, promoted by state propaganda, not at last in schools. That makes the monument being a touristic mass destination nowadays. The upper three galleries of Borobodur. In any of these alltogether 72 semi-transparent stupas is a Buddha statue sitting. They all are individual and show different positions of meditation. It's particularly difficult to clean the stupas and their interiours after Merapi's volcanic ashes pour a layer on the whole monument. Besides, these stupas are a favourite target for sportive visitors who love to climb on them. In the mid 1990s there wasn't that much tourism here and the tourists came in a great part from western countries. Now there are few western tourists visiting Borobodur, but masses of Indonesians, coming in groups, most of them are big groups from schools. The majority of them has no sense for the meaning of the building and are obviously not prepared to go here. They rather behave like on a fair and do harm the building by climbing on the statues and stupas, drawing on them with paint, they litter around, commit vandalism and are very noisy. There is a superstitious belief that, touching one of the Buddhas in the semi-transparent stupas on the highest three levels, brings one money in the future. Therefore a great number of the Indonesian visitors climb the stupas and do a great effort to reach with their arms inside. Asian tourists biggest pleasure at sights is to stand in front of them and getting photos of themselves. Besides they are extraordinarily noisy. 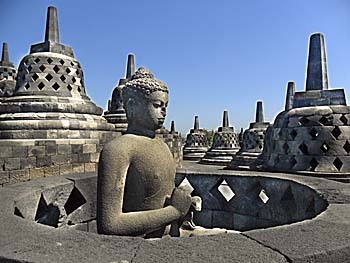 Approximately 2.500.000 people visit Borobodur annually. There are serious concerns about the long-term effect of mass tourism on the building. Although there are specially trained guards who's task is to stop visitors from climbing and touching statues and reliefs, there is no way to stop them all. The 2010 eruption of the Merapi, the biggest since the great outbreak of 1872, covered Borobodur under a 2 - 3 centimeter thick layer of ashes. These ashes contained acid substances which harmed the surface of the building, particularly the relief panels (the vegetation around also suffered severely under it). The temple complex had to be cleaned thoroughly. It was closed therefore for a time. The Merapi has more or less frequent outbreaks all four to five years. Every time the monument gets harmed by the volcanic ashes. In the 1980s there was a wide area around the monument cleared for the installation of the huge Archaeological Park. This clearing included forced evacuation of villages. Governments frequently play very rough with their people, particularly here in Indonesia. As a reaction to the turnouts eleven explosives were placed on the top of the monument in 1985, most of them in the stupas of the upper three levels. Nine of the explosives blew up and caused considerable harm to the monument. The Indonesian police claims that the attack was done by islamic extremists. In mid 2014 the ISIL (Islamic State of Iraq and the Levant) threatened to attack the monument again. The buddhist building is not in congruence with islamic principles, they announced. The verymost tourists who are coming to Borobodur just have a shorter or longer look for the monument and leave the place soon after. Although the village is not itself worth to stay or to look much around (except candi Mendut and candi Pawon), it's worth to spend some time in the surrounding. The Kedu plain is one of Java's rural places, where the people and the atmosphere is much more relaxed than in the urban centers. Although the population growth produced many villages in the last decades, there are still wide areas covered with rice paddies. Since the Kedu plain is surrounded by mountains, it's recommendable to make one or two of the easy trips just walking up any path and having a look around from up there. It's rather quiet there and provides an overview over the landscapes.